You are here: Home / What is Purim? Purim, which literally means “lots,” is the holiday in which Jews commemorate being saved from persecution in the ancient Persian Empire. According to the Book of Esther in the Bible, the Jews of the city of Shushan were threatened by the villain Haman, a prime minister who convinces the King Ahasuerus to kill all the Jews (because the Jewish Mordecai refused to bow down to Haman). Haman casts lots (hence the name of the holiday) to determine the date he would carry out his plan: the 13th of Adar. In the end, the Jews are saved by the heroic Queen Esther, Mordecai’s niece (and adopted daughter), who married Ahasuerus (after he banished his first, rebellious wife Vashti). When Ahasuerus discovers that his wife Esther is Jewish, he decides to reverse Haman’s decree, and instead of the Jews being killed, Haman, his sons, and other enemies are killed instead. Purim is the most raucous holiday on the Jewish calendar (see mandatory alcohol drinking below). Observance of the holiday begins with dressing up in costume: some people choose to dress as characters from the Purim story, and others dress in non-Purim-related costumes. It is a mitzvah (commandment) to listen to the story of Purim chanted from Megillat Esther (“The Scroll of Esther”) and to hear every word. It is customary to make loud noise with a noisemaker called a ra’ashan in Hebrew, or grager in Yiddish, every time Haman’s name is mentioned, in order to fulfill the obligation of blotting out Haman’s name. Part of the holiday also includes giving gifts or charity to the poor, called matanot l’evyonim. A fun tradition on the holiday is to perform a Purim spiel, a satirical show either dramatizing the Purim story in a humorous way, or just a funny skit on any theme. 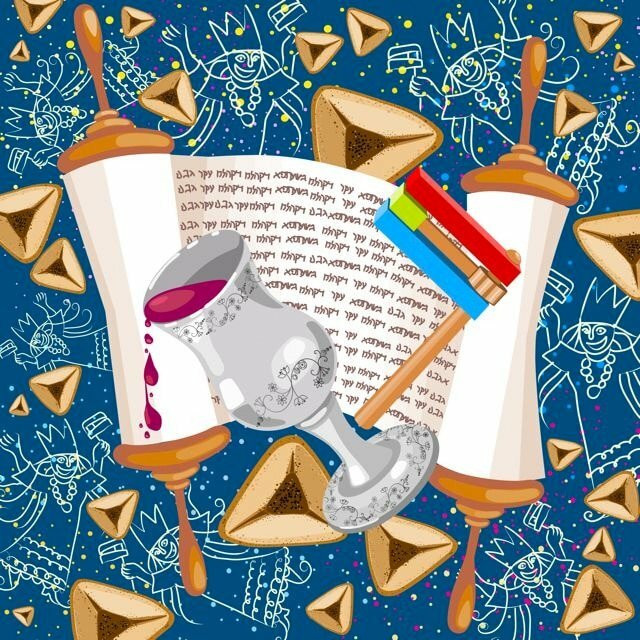 What kinds of foods are eaten on Purim? Mishloach manot (“sending of portions”) are packages of treats and goodies sent to friends and family on Purim. It is traditional to have a jovial feast, or Seudat Purim, in the evening of the holiday. Drinking alcohol is mandatory on Purim, and in fact, the requirement in the Talmud goes so far as to instruct that one should get so drunk that they can’t tell the difference between the phrases Arur Haman (“cursed is Haman”) and Baruch Mordechai (“blessed is Mordecai”). Traditional foods include Oznei Haman or Hamentaschen (“ears of Haman”), a triangular cookie usually filled with different flavors of jam, which is supposed to represent either Haman’s ears or his three-cornered hat. Another triangular shaped food that is customary to eat are kreplach, small dumplings usually filled with meat, mashed potatoes, or other fillings. Other traditional foods are dishes made with beans, a reminder of what Esther ate in the king’s palace in order to avoid eating non-kosher foods. Because of this Esther/ legume tradition, Purim is often celebrated with a vegetarian meal. What is the proper greeting for Purim? On the Hebrew calendar, Purim is celebrated on the 14th of Adar, the day after the Jews emerged victorious against the evil Haman.